John I.Carlson, founder and corporate industrialist was active until his death in 1971. He always attributed his success to the ongoing research and development of new products, quick anticipation of industry equipment requirements and the dedication and commitment of the entire Carlson organization. In 1977 Cliffard D. Carlson passed away. He will always be remembered as an industrial executive with strong business expertise and leadership qualities. His contributions to the brush making industry were many. Under his direction Carlson gained international stature and recognition with the American Brush Manufacturers Association. "Cliff", as he was known to his many friends and business associates, will be remembered for his "watch dog" title when he served as congressman for Illinois and the nation. In 1977, John M. Carlson, son of Cliffard D., was elected as president of the company. John, a third generation of the Carlson family, and a graduate of Colorado State University, started with the company in 1974. John readily accepted the challenge but also received a baptism of fire.........re-defining how we do business today! One of many priorities, his first was to address the transition from first generation Brush Machines and personnel with electro-mechanical backgrounds to Computerized machines utilizing the latest technologies. Secondly, with a soft market in the early 1980's, sales of Carlson Equipment domestically and internationally became difficult as Carlson's competitors were being heavily subsidized by their governments. The dollar also became a factor and the exchange rate did nothing to compliment the situation as Carlson Tool moved closer to a global market economy. Gunnar Hanson, Carlson's Director of Marketing and an employee of 44 years, has been heard to say that "young John" also has an ingenious mind and has all the tools to propel the company into the 21st Century. Over the last 20 years John Carlson has been the driving force in the development of computerized brush machines. The ever changing demands of the brush industry with new brush designs, higher production requirements, and the desire to produce higher quality brushes more economically will unquestionably continue to motivate further development of Carlson Equipment. Today, Carlson-STI, is stronger than ever and is being managed by a team of Engineers including John M. Carlson and is involved in the design and development of brush making equipment which are highly competitive and technologically in tune with today’s global needs. Carlson-STI has designed a new low cost brush making equipment proudly made in USA enabling customers to get US made product at competitive prices. To quote John, "we are not involved in a cold war anymore, it's now an economic war and we must compete and produce or we become extinct." Carlson-STI has an excellent product, excellent people, and an excellent name in the industry. 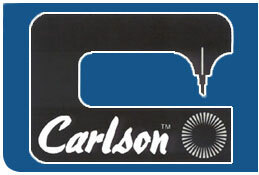 Carlson proudly continues to serve over 500 brush manufacturers in both the U.S. and world-wide.